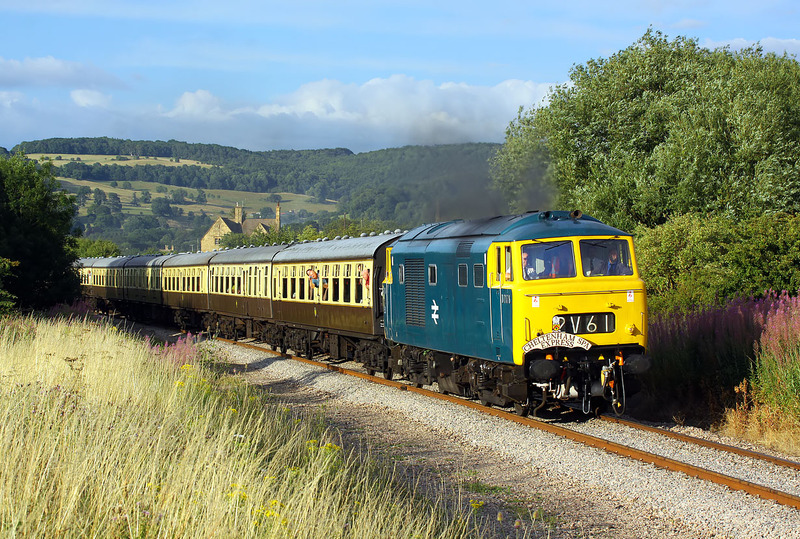 D7076 passes Hailes on 25 July 2015 with the 1C91 19:15 Toddington to Cheltenham Racecourse service, during the Gloucestershire Warwickshire Railway's Diesel Gala. After a day of mixed sun and cloud, a large bank of more solid cloud moved in from the west during the evening. It seemed that this might scupper any chances of getting this picture in the sun. However, I could see there was a clear patch beyond this cloud, and as the sun was sinking fast, I guessed it would eventually drop into this clear patch. Right on cue, just before the booked time, and after I had found one of the few locations that was clear of shadows, the sun dropped out of the cloud to produce this superb late evening light.